The Speed World Challenge series returned to Le Circuit Trois-Rivieres following the cancellation of the Grand Prix of the Americas round at Miami. 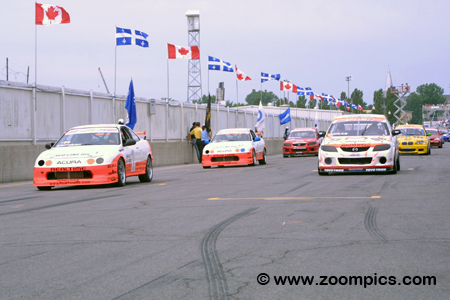 Competitors would race around Trois-Rivieres’ eleven-turn 1.53-mile temporary street circuit for fifty-minutes. Thirty-five entrant’s line up for the start of round seven for the Speed World Challenge Touring Cars at Le Circuit Trois-Rivieres. On the pole, for the third time, this season is the point’s leader and defending series champion, Pierre Kleinubing. 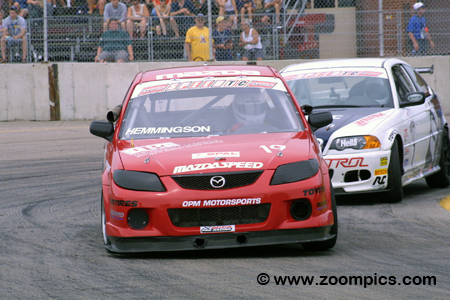 Sharing the front row with Kleinubing is the Mazda Protege of Charles Espenlaub. Immediately behind these two are Kleinubing’s teammate, Peter Cunningham and Will Turner driving a BMW 325i. OPM had a terrible start to the weekend. 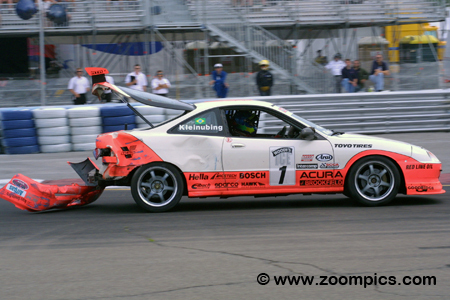 Team owner, Tom Fowler encountered brake problems which resulted in severe damage to his car and prevented him from participating in the race. Fowler’s teammate, Chuck Hemmingson missed much of practice. During qualifying, Hemmingson was fourth fastest and his fortunes changed for the better during the race. He inherited the lead on lap-24 and scored his first victory since 1999. Another driver to benefit from issues encountered by the faster qualifiers was eighth place starter, Ken Dobson. 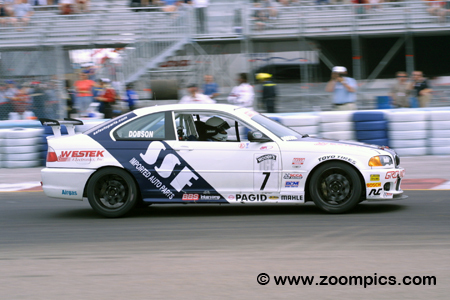 Dodson scored his first series victory in round two at Mosport but failed to finish at Mid-Ohio and Road America. In the previous weekend at Washington, he could only manage a seventeenth-place finish. 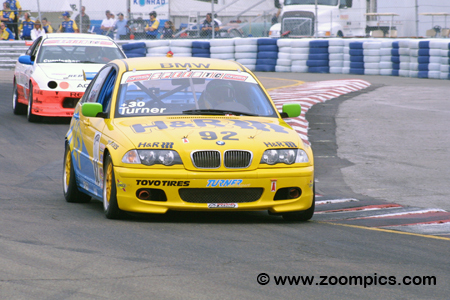 The attrition at Trois-Rivieres allowed Dobson to capture his second runner-up result of 2002. The No. 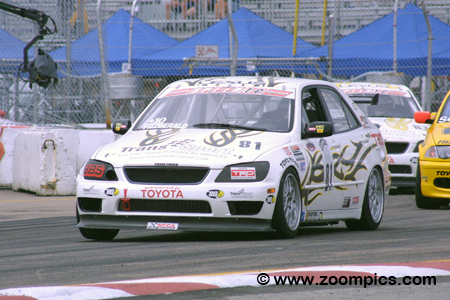 81 Team Franz Blam Racing prepared Lexus IS300 was driven by Mike Fitzgerald. The car made its debut in the season’s first race at Sebring. At each event, the Lexus was showing more promise. In the previous weekend at Washington, Fitzgerald started second and finished third. During qualifying a Trois-Rivieres, he was ninth fastest but Fitzgerald was able to capitalize on the misfortunes of the leaders and grab another podium finish. 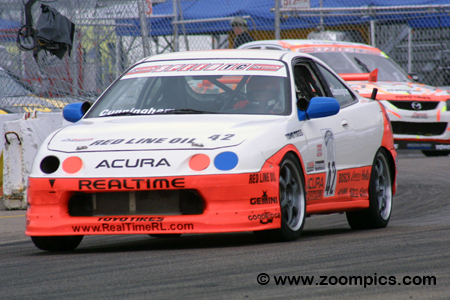 RealTime Racing’s, Peter Cunningham moved to first place in the title chase at Trois-Rivieres. Cunningham inched closer to the championship leader, Pierre Kleinubing when Kleinubing did not score any points in the previous round at Washington. Kleinubing’s retirement at Trois-Rivieres meant that he failed to add to his total again. Kleinubing’s results and Cunningham’s fourth-place finish contributed to the change in the standings. Will Turner entered Trois-Rivieres third in the title chase (six-points behind Peter Cunningham and thirteen-markers shy of Pierre Kleinubing). Turner put the Turner Motorsports BMW 325i fourth on the starting grid. With Kleinubing’s incident on lap-6 of the race, he took the lead. 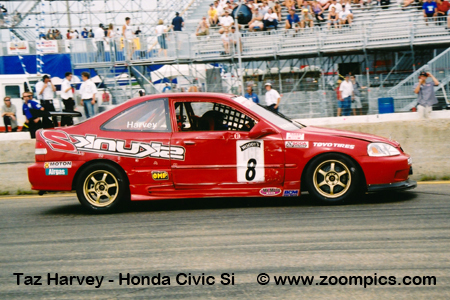 Turner was in first place until he started experienced transmission problems on lap-23. Turner would lose the top spot and finish twenty-eighth. At Trois-Rivieres it appeared that the championship leader, Pierre Kleinubing was going you make up for the miserable outing he had in the last event at Washington. In round six, he failed to score any points and his advantage over Peter Cunningham shrunk. Kleinubing started the weekend by qualifying on the pole but a brake failure on lap-6 resulted in a crash. The damage to the car forced him to retire, Kleinubing finished thirty-fourth. The B&M Hole Shot Award is given to the competitor that advances the most positions on the opening lap. At Trois-Rivieres, three drivers met this criterion (they improved their starting position by three spots) and a tie-breaker had to be used. Frank Selldorff gained a total of five places in the first two laps and received the honour. 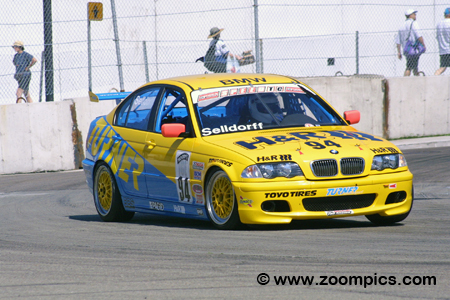 Unfortunately, the remainder of the race didn’t go as well – Selldorff finished twenty-first.